If you’ve ever had to rush to get ready, you know how easy it is to drop things, miss items, and generally create a big mess that will have to be cleaned up when you get home. 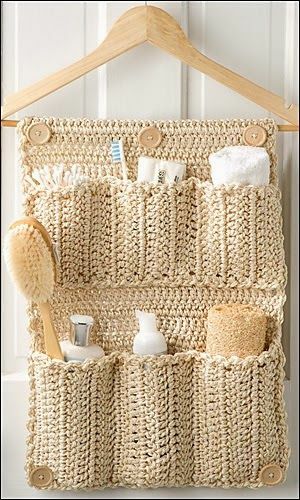 How about making things easy on yourself and utilizing one of these bathroom organizers? With several sizes to choose from, you’re sure to find one that works for you, whether you want one for all your makeup brushes, or your lotions and shampoos, or your soap, washcloths and razors. So where do you begin? How about a bathroom door organizer? It uses a hanger to attach to the door, and it’s the perfect size for mid-range items like a scrub brush, shampoo bottle, facial cleanser, sponge, and washcloths. You can find the link through Thrifty DIY Diva, Annie’s Catalog or the Crochet World magazine. You can also download the pattern for a small fee. Or, if you find you have more difficulty keeping track of all the body wash, shampoos, conditioners, scrubs, and soaps in the shower, you could try the shower organizer from Patrones Asgaya, which has a handy chart to illustrate the pattern. Please note, the pattern is in Spanish so Google Translate or Babblefish might come in handy. If you’re always rushing to find your keys, phone, and chapstick, you might want to try the doorknob organizer from Debra Arch. It was originally published in Crochet World but is available for a minimal fee through Annie’s Catalog and Ravelry. You’ll need an “F” size hook and nylon cord for the project, along with a tapestry needle, a metal carabiner, a one-inch metal key ring, and a three-inch metal ring for the handle. 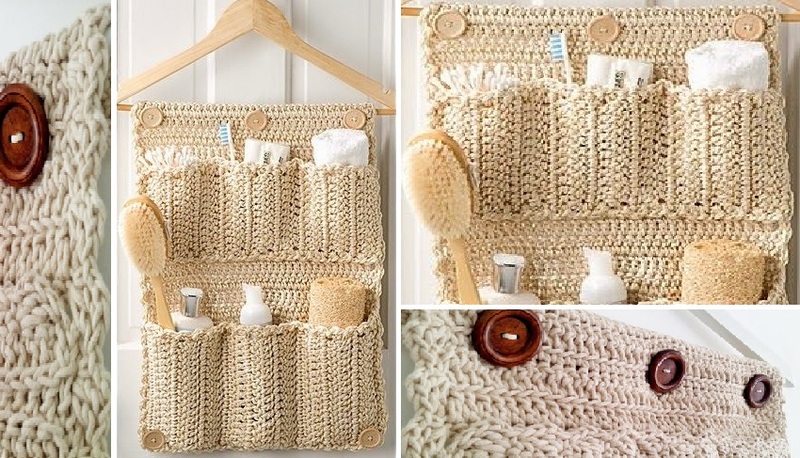 There’s also a free bathroom organizer crochet pattern from Lilla Bjorn on Notey that uses knitting needles (metal suggested if you’re storing heavier items) to hold up the pockets instead of letting them droop. It’s a cute, unique look for those who love everything fibre arts. If you want to try this pattern, you’ll need yarn (suggested: Bloom yarn by Sheepjes), a 4mm crochet hook, three curtain rings, two knitting needles, scissors, and a tapestry needle to complete it. The patterns and links for all your organization needs can be found at the following websites: Ravelry, Thrifty DIY Diva, Annie’s Catalog, Patrones Asgaya, and Notey.